We don’t think about how much we use our knees until they are hurting. Knee pain can cause every step to be excruciating, and because there are many causes of knee pain, it can be difficult to find the right kind of relief. 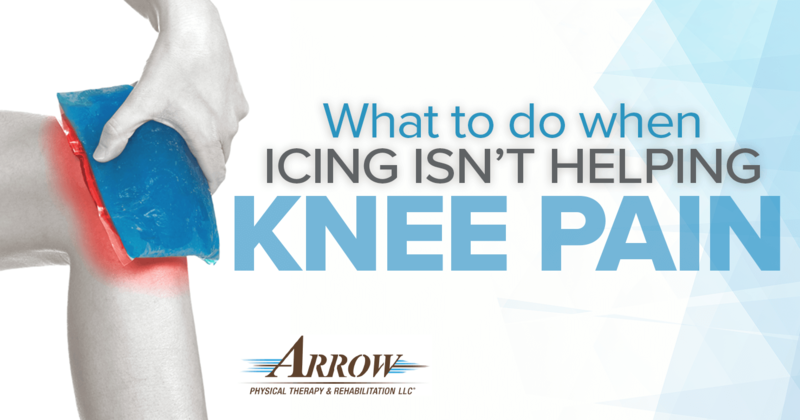 The most common treatment option for knee pain is to ice the sore area, but what do you do when ice no longer works to reduce your pain? Our team of certified physical therapists at Arrow Physical Therapy and Rehabilitation works with patients to help find relief from chronic knee pain. Take a moment to read through some of the treatment options that may work better than icing your knee, and feel free to contact our team with any questions you may have. Wrap or Brace Your Knee – Wrapping your knee when you know you’ll be walking around, working out, or being active is a good way to keep the joint from getting stiff, but still offering light support. It is best to wrap your knee only when you’re going to be active, unless directed by your physical therapist or another medical professional. Consider Your Footwear and Insoles – The type of shoes we wear can have a direct impact on the overall health of our knees. Try putting supportive insoles in your favorite shoes, which may help take some of the pressure off of your knees and offer you some relief. Exercise – Contrary to what you may think, resting too much might cause the muscles around your knee to weaken and hurt more. Low impact exercises such as swimming and certain yoga stretches may help strengthen your knee without causing further injuries. If you need more than ice to relieve your chronic knee pain, a physical therapist or other medical professional can help you find a treatment plan that fits your needs. Our team at Arrow Physical Therapy and Rehabilitation can recommend specific exercises and stretches targeted to strengthen your knee and help reduce your knee pain. If you are in the Woodbridge, Edison or Union area of New Jersey, and you are experiencing knee pain, contact our physical therapy office near you today to schedule an appointment or fill out the appointment request form on our website. Let us make a personalized treatment plan to help you find relief from your chronic knee pain. Contact us today!